ITERA Ireland – Let the scheming begin.. The internet must have been glowing last night with the back & forth chatter!! Basically a rough, very rough outline of what to expect for each stage with nicely rounded numbers offered for an indication of duration and distance. All this serves to do is get teams cogs whirring, ramp up the rumour mill (of course no one offers their thoughts outside of their own team…it’s very hush, hush like that 🙂 ) and then throw us all for a wobbly when we actually get the rule book and race format at the Team meeting the day before the off. It does give us some idea of what to expect and how much to pack – lots of shoes and spare socks!! 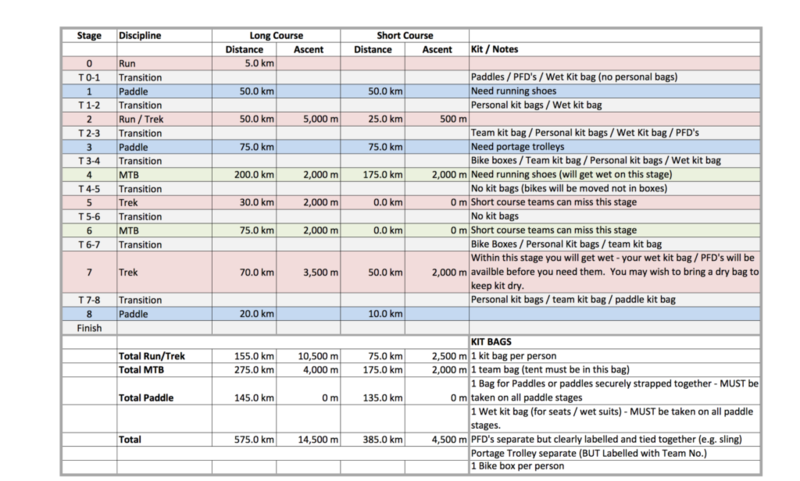 As promised there is a heavy focus on kayaking with 135k to be covered regardless of whether you go long course or short course and two massive stages (50k and 75k). Other ‘interesting’ things are the stage 2 trek with 5000m of elevation and the 200k mountain bike. The race website will be live for tracking once the race starts. There will be tough competition between the Irish teams for a place on the podium and first Irish team also wins a spot in the ARWS final in Australia. Enduro’s team took the honours in the ARES Beast of Ballyhoura this time last year and are bound to be one of the favourites but they’ll have to be on top of their game this time around for national honours with competition from, amongst others, the Defence forces, DAR Dingle who have experienced ARWS action in Africa this year, a Moxie team bolstered by the addition of Pavel Paloncy and the strong and experienced team making up Rachel’s adventurers. Godzone will likely be favourites for the win but Swecco, Issy adventure, team endurance life and the Irish teams will all give them a good run for it! No matter how you look at it, kicking off in 1 week, 5 days and a fistful of hours will be one of THE most epic adventures we will have undertaken.